Baillon, Aurélien, Zhenxing Huang, Asli Selim, & Peter P. Wakker (2018). "Measuring Ambiguity Attitudes for All (Natural) Events" Econometrica, vol 86:5, pp.1839-1858. Baillon, Aurélien (2017). "Bayesian markets to elicit private information." Proceedings of the National Academy of Sciences, vol. 114:30, pp. 7958–7962. Baillon, Aurélien (2017). "Prudence with respect to ambiguity." The Economic Journal, vol. 127:604, pp. 1731-1755. Baillon, Aurélien, Olivier l'Haridon, & Laetitia Placido (2011), "Ambiguity models and the Machina paradoxes," American Economic Review, vol. 101:4, pp. 1547-1560. Abdellaoui, Mohammed, Aurélien Baillon, Laetitia Placido, & Peter P. Wakker (2011), "The rich domain of uncertainty: source functions and their experimental implementation," American Economic Review, vol. 101:2, pp. 699-727. Baillon, Aurélien & Laetitia Placido (forthcoming). "Testing constant absolute and relative ambiguity aversion." 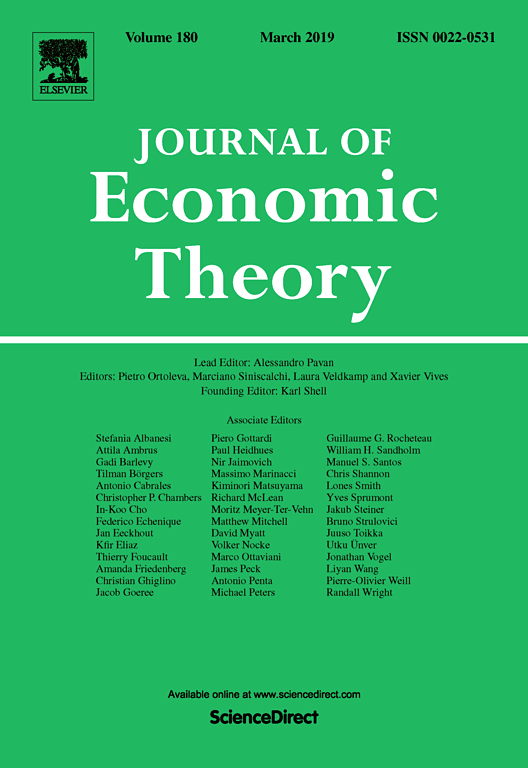 Journal of Economic Theory. Baillon, Aurélien, Han Bleichrodt, & Vitalie Spinu (forthcoming). "Searching for the reference point." Management Science. Baillon, Aurélien & Aysil Emirmahmutoglu (2018). "Zooming in on ambiguity attitudes." International Economic Review, vol. 59:4, pp.2107-2131. Baillon, Aurélien, Han Bleichrodt, Umut Keskin, Olivier l'Haridon, & Chen Li (2018). "The effect of learning on ambiguity attitudes." 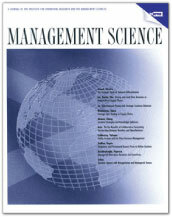 Management Science, vol. 64:5, pp.2181-2198. Baillon, Aurélien, Harris Schlesinger, & Gijs van de Kuilen (2018). "Measuring higher order ambiguity preferences." 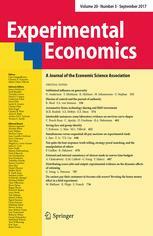 Experimental Economics, vol. 21:2, pp.233-256. Baillon, Aurélien, Han Bleichrodt, Zhenxing Huang, & Rogier Potter van Loon (2017). "Measuring ambiguity attitude: (extended) multiplier preferences for the American and the Dutch population." Journal of Risk and Uncertainty, vol. 54:3, pp. 269-281. Baillon, Aurélien, Ning Liu, & Dennie van Dolder (2017). "Comparing uncertainty aversion towards different sources." Theory and Decision, vol. 83:1, pp. 1-18. Baillon, Aurélien, Han Bleichrodt, Ning Liu, & Peter. 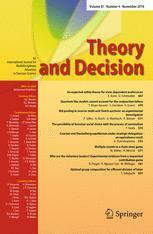 P. Wakker (2016) "Group decision rules and group rationality under risk," Journal of Risk and Uncertainty, vol. 52:2, pp. 99–116. Baillon, Aurélien, Philipp Koellinger, & Theresa Treffers (2016) "Sadder but wiser: the effects of affective states on ambiguity attitudes," Journal of Economic Psychology, vol. 53, pp.67-82. Baillon, Aurélien, Asli Selim, & Dennie van Dolder (2013), "On the social nature of eyes: the effect of social cues in interaction and individual choice tasks," Evolution and Human Behavior, vol. 34:2, pp. 146-154. Baillon, Aurélien, Bram Driesen, and Peter P. Wakker (2012), "Relative concave utility for risk and ambiguity," Games and Economic Behavior, vol. 75:2, pp. 481-489. Baillon, Aurélien, Laure Cabantous, and Peter P. Wakker (2012), "Aggregating imprecise or conflicting beliefs: an experimental investigation using modern ambiguity theories," Journal of Risk and Uncertainty, vol. 44, pp. 115-147. Baillon, Aurélien (2008), "Eliciting subjective probabilities through exchangeable events: an advantage and a limitation," Decision Analysis, vol. 5:2, pp. 76-87. Aurélien Baillon, Han Bleichrodt, Chen Li, & Peter P. Wakker "Belief Hedges: Applying Ambiguity Measurements to All Events and All Ambiguity Models". Johnson, Cathleen, Aurélien Baillon, Han Bleichrodt, Zhihua Li, Dennie van Dolder, & Peter P. Wakker "Prince: An Improved Method For Measuring Incentivized Preferences". Baillon, Aurélien, Yoram Halevy, & Chen Li " Experimental Elicitation of Ambiguity Attitude using Random Incentive System".